Imprint: American Bank Note Co. N. Y. Date Issued: Apl. 16th 1866. 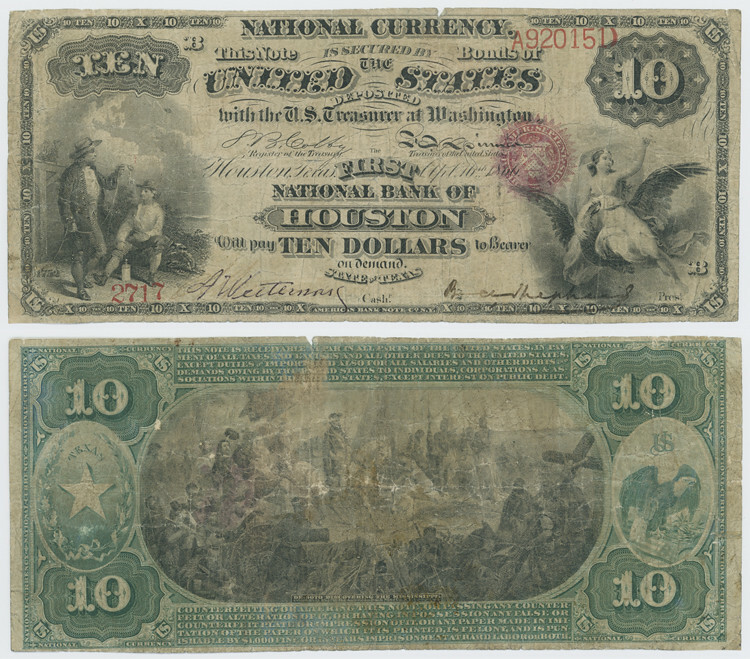 Notes: This $10.00 National Bank Note was issued in Houston in 1866 by the First National Bank of Houston. Bank serial number: 2717. Treasury serial number: A920151. Charter number obtained from: Standard Catalog of United States Paper Money by Chester L. Krause and Robert F. Lemke. Signatures: S. B. Colby Register of the Treasury. ; F. E. Spinner Treasurer of the United States. ; [illegible] Cashr. ; [illegible] Prest.